GNR bow-ended wagon, part 1. I suppose I ought to prove there is some building going on, not just the collecting of kits, lounging about ‘researching’ and writing reams of waffle. The Great Northern Railway plays an important role in the history of the Widened Lines (I’ll tackle it later), but for the purposes of this post, there was a huge amount of goods, much of it bound for Farringdon Street goods depot. I have very little prototype info for these wagons which were apparently built in some number. The bow-ended design was typical on many pre-grouping railways in the Victorian period, though by the turn of the century had became non-standard on many, with some notable exceptions such as the LB&SCR. Nevertheless, there were still fifty-eight GNR examples in traffic at Grouping and a photo of 418614 appears in LNER livery in Tatlow Vol.1 p21. However, the later life of these wagons is unimportant here, and I’m chiefly concerned with their appearance in the 1890s. Concerning the livery, I’m considering lettering these wagons in the pre-1898 style with the small “G Northern R” as it was at least a decade if not more before the old livery was completely eradicated, and I think it would suit the archaic design well. I’m not sure about the complete history of the kit – Wagon & Carriage Works had them in their range until 2003 as cat. no. WW133 when they passed to Ace Kits who have not marketed them since. I recently contacted the current owner who agreed to sell me some examples if he could find enough etchings and castings from the unopened box of bits he’d acquired back in 2003. 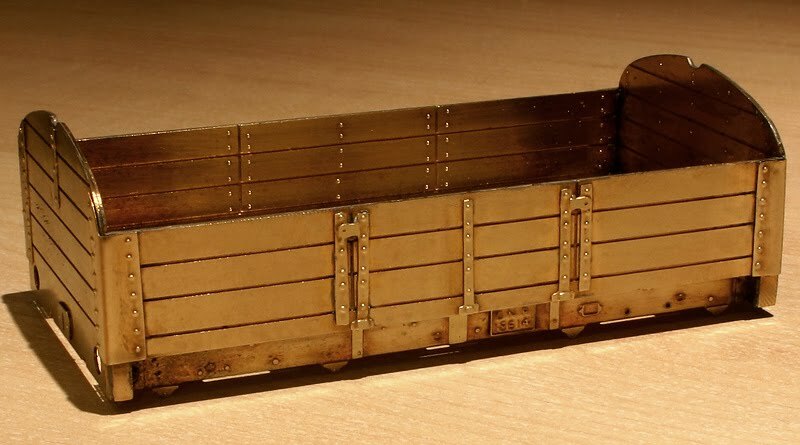 I began this wagon in early 2008 (hence the tarnished aspect to the brass), along with a few other kits to gauge how they went together, but unrelated events caused it go back into the box of uncompleted kits, and it’s not re-emerged since. As to the build, so far so good, though the hand-drawn nature of some of the etchings is evident – more so in this close-up shot than in the flesh, and hopefully Bill Ascough will reintroduce the kit into his range soon.